I think you might have a Slate Junco there, they are common at this time of year, they stay throughout the winter, and then they are gone again. We get them here in St Thomas too, they seem to travel in flocks and when they fly, you can see a flash of black and white as they fly away. If any of our readers know for sure what this bird is, please let us know! The junco or snowbird we get them here and every time I see them the next day we get snow :( They are also know as snowbirds from Anne Murray's hit song. They are so cute. Thanks for the clarification. We also have these lovely little black and white birds that come to our bird feeder and I always wondered what they were. I am getting a lot of Juncos this year in Barrie,Ontario. My bird seed supplier told me that they forage for food on the ground. That is their habit of eating. Sorry to hear they disappear in the Spring. 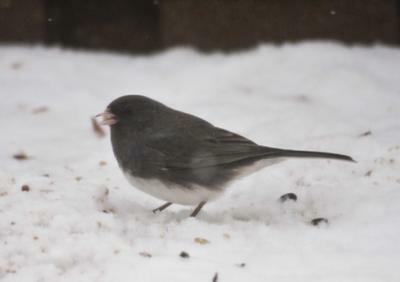 This is a typical Junco and I get a lot in my back yard eating the fallen seeds from my feeder. The Sparrows gobble up the seeds so much that the Juncos stay on the ground and eat what they have dropped! I have seen something very similar to what has been identified as a Junco. The ones I have been seeing are dark bluish gray with some white feathers in its tail visible only when landing. I don't know much about birds and thought it was a blue-gray Gnat-catcher. Yes, that bird is a Junco. They come to Niagara too in winter, and then leave in early spring. We feed them sunflowers seeds and they love to eat the seeds from my garden flowers. The bird in the picture is a JUNCO. Very common in winter around Georgetown.